Originally from Bukavu in RDC, Dieudonné, became Programme Coordinator of DR Congo Bridges to Justice in 2017. Previous to this, Dieudonné worked with IBJ offering pro-bono legal services. He completed his undergraduate studies in Latin and Philosophy and then successfully graduated in Private and Judicial law from the University of Bukavu. As well as qualifying as a defense lawyer, he obtained certificates in International Humanitarian Law and International Law. Dieudonné completed internships at the TGI de Bukavu and the Institut National de Sécurité Sociale, as well as working with the Fondation Solidarité des Hommes on projects regarding detention. Additionally, he partnered with the American Bar Association on projects regarding children in conflict with the law. Dieudonné also teaches Law at the Centre Multimédia Langue et Métiers and at the Ecole National du Cadastre et des Titres Immobiliers in Bukavu. Jean-Pierre BAHAYA SHABANI was born on March 25, 1982 in Cegera, in the territory of Kabare, South Kivu, Democratic Republic of Congo. He was educated at Kabindi Lwiro primary school where he obtained a Certificate of Completion in 1996. In 2005, Jean-Pierre obtained a state diploma in Latin and Philosophy at the Kayandja Institute in South Kivu. He began his university studies in 2006 at the University of Bukavu Faculty of Law where he obtained a degree in Public Law, and awarded his Graduate diploma in 2009, followed by his legal practitioner license in 2011. In March 2017, Jean-Pierre joined the DRC BJ team as a volunteer lawyer, where he provided quality legal assistance to indigent detainees who were unable to afford a lawyer. He also assisted in organizing roundtables event, rights awareness campaigns, and visiting ‘cachots’ to monitor the conditions in which prisoners were kept. Since July 2018, Jean Pierre has been employed by DRC BJ as Senior Lawyer. Jean-Pierre has participated in all the workshops and trainings organized by IBJ and DRC BJ including the Training of Lawyers and Judicial Defenders in October 2017 on Strengthening Access to Justice and the Rule of Law in the Republic Democratic Republic of Congo, which was held in Bukavu in collaboration with the Bukavu Bar Association. Jean-Pierre is married and the father of one child. Pascaline MBALABALA was born on April 9, 1993 in Bukavu, DR Congo. After finishing high school, she continued her university studies at the Catholic University of Bukavu Faculty of Law where she obtained her degree in Economic and Social Law. After her studies, Pascaline was offered a professional internship at J-C MUBALAMA ZIBONA Innocent RUMBAKA and Associates, where she completed three months of training. She joined the DRC BJ team in August 2017 as a trainee, before being promoted to DRC BJ Program Associate, where she provides quality legal aid to indigent detainees who are unable to afford a lawyer. She is also involved in the organization of round tables, street and radio awareness campaigns and visits to ‘cachots and amigos’ to monitor the conditions in which prisoners are kept and provide legal assistance. Pascaline was sworn in as an attorney at the Bukavu Bar in December 2018. She has also participated in all the workshops and trainings organized by IBJ and DRC BJ including the Training of Lawyers and Judicial Defenders in October 2017 on Strengthening Access to Justice and the Rule of Law in the Republic Democratic Republic of Congo, which was held in Bukavu in collaboration with the Bukavu Bar Association. Koko RUKENGEZA was born in Bukavu on 31 December 1990, and joined DR Congo Bridges to Justice in 2017 as a volunteer. After obtaining a state diploma in Latin-Philosophy, Koko pursued to study law and obtained a degree in Economic and Social law from the Bukavu State University in 2015. 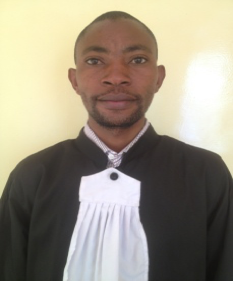 At the end of his studies, he joined the Corps of Judicial Advocates of the Bukavu High Court, taking taking an oath to defend the cases of indigent and destitute clients in Bukavu Central Prison. At the same time, he joined the firm KITAMBALA in Bukavu where he worked as legal counsel on civil, commercial, social and criminal cases until 2018. In October 2017, Koko participated in the training of Lawyers and Judicial Defenders organized by International Bridges to Justice and DR Congo Bridges to Justice (DRCBJ). Following the training sessions, he joined DRC BJ as a volunteer to help fight against the use of torture in the Great Lakes Region. Since November 2017 Koko has worked with DRC BJ to provide legal representation to indigent detainees, to conduct visits to monitor conditions in ‘cachots et amigos’ cells, and to plan and conduct roundtables and rights awareness events. Félix AGANZE MUHINDO was born on June 7, 1989 in Mufunge, Kabare territory, in South Kivu, DR Congo. In 1997 he began his primary studies at Nyantende Primary School where he obtained his Certificate of Completion of primary studies in 2003. Between 2003-2004, he continued his secondary education at the Nyantende Institute College, Saint Antoine de Padoue, where he obtained the state diploma in Latin-Philosophy in 2010. Félix continued his university studies at the University Of Bukavu Faculty Of Law. In 2015 completed his degree in Private Law and Judiciary. Félix then completed an internship at the KITAMBALA law firm between 2016 and 2017. He was also secretary of the non-profit organization ‘Fondation Culturelle pour l’Afrique Cultural’ from 2014 to 2016, and Advisor of the Cibanda Students Club from 2013 to 2015. 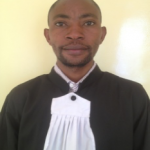 As of July 22, 2017 Félix joined the Corps of Judicial Defenders at the Kavumu High Court. In November 2017 he joined the DRCBJ team as a volunteer, and assisted in all DRC BJ activities.